In Chennai in the month of Marghazhi, you cannot escape hearing Thiruppavai in the early hours of morning if you are staying near a temple of Lord Vishnu. Thiruppavai is a devotional work of thirty verses extolled as the nectar of Vedas by Vaishnavite scholars though on surface it sounds like a call by a Gopi of Brindavan to her mates to wake up and join her in observing “Pavai Nonbu”. Thiruppavai is the most well-known piece in Nalayira Divya Prabhandham which is hailed as Tamil Vedas in Vaishnavite circles and is composed by Andal, the most well-known among the twelve Alwars. Moreover she is the only female among the twelve, besides being the youngest. And Andal is not her original name. She had been named as Kodhai, by her father Vishnuchithar, who found her in his flower garden under a Tulasi plant. As he had no family of his own, he rejoiced that it was God’s gift and named her as Kodhai, a gift of Mother Earth and brought her up as his own daughter. Vishnuchithar, who is known as Perialwar, lived in Srivilliputhur and was a great devotee of Lord Vishnu and also an accomplished scholar of devotional literature. So Kodhai grew up in an atmosphere of love and devotion hearing stories and songs about the Lord. She grew up as an ardent devotee of Lord Krishna and even at a very young age of five wanted to marry only Lord Krishna. Kodhai used to help her father in weaving garlands for submission to the Lord in the local temple. Her passion for Lord Krishna became so great that she used to imagine herself as the bride of the Lord and wear the garland first before submission to the temple. One day this practice came to the notice of her father who regarded it as blasphemy and chided her. Then discarding that garland he wove a fresh garland and submitted to the Lord. That night Lord came in the dream and asked him why he did not submit the garland that Kodhai wore and insisted that he should thereafter submit such garlands which have adorned Kodhai’s neck first. Vishnuchithar woke up with a start and was thrilled with happiness to recollect the dream. He realized his daughter was a divine child whom Lord Himself held dear and from that day started referring to her as Andal, as she seemed to rule over the Lord, We shall refer to her hereafter as Andal. She is also referred to as “Chudi kodutha sudarkodi” from this incident. As Andal grew up her determination to marry the Lord only and none else also grew. When she reached the marriageable age and learnt all about all the Archavathars, she became more specific and wanted to become the bride of Lord Ranganatha of Srirangam, whom she believed as none other than Lord Krishna, her heart’s idol. Vishnuchithar’s efforts to discourage her failed and he was worried how this wedding could take place, His concern was resolved by Lord Himself, who appeared in his dream and asked him to bring her to Srirangam decked as a bride. Lord appeared in the dream of temple authorities as well and asked them to send a palanquin to Srivilliputhur for Andal's journey to Srirangam. When King Vallabha Deva came to know of this he made elaborate arrangements with festoons, music and other paraphernalia befitting this divine wedding. He also joined the bridal party as it made its way from Srivilliputhur to Srirangam with crowds lining the route and cheering the procession and with Vishnuchithar leading the procession filled with both Joy and sorrow. As the procession entered the temple Andal jumped out of the palanquin and ran into the sanctum to fall at the feet of her Lord. As she worshipped at the feet of the Lord her physical body merged in a blaze of glory with the deity, Lord Ranganatha. She was barely fifteen when her union with the Lord took place. In this short life she composed two poems which are famous for their philosophical content and literary merit. They are Thiruppavai with 30 verses and Nachiar Thirumozhi with 143 verses. Both of them find a place in Mudhal Ayiram of Nalayira Diva Prabhandham. Of these the shorter Thiruppavai is more popular and widely-known. In this she transports herself to the time and place where Sri Krishna lived as a child before leaving for Mathura and imagines herself to be one of the Gopis who enjoyed his company then. This is a favourite of Sri Ramanujar, who is also called “Thiruppavai Jeer”. He used to sing the Thiruppavai verses when going on his rounds for bhiksha in Srirangam. One day as he was at the doorstep of his Guru Periya Nambi he was singing the verse starting with “உந்து மதகளிற்றன் ----”(Undhu madha Kalitran---). As he was singing “கடை திறவாய்” (kadai thiravai) Peria Nambi’s little daughter came out opening the door to offer him Bhiksha. Immediately he fell at her feet, as he saw in the six year old, Sri Andal herself responding to his call to open the door. Sri Ramanujar is also spoken of as elder brother of Sri Andal i.e.அண்ணா, because of an incident. Sri Ramanujar was singing Sri Andal’s Nachiar Thirumozhi in the presence of the Lord in Thirumalirum solai. When he came to the following lines he realized that though Andal had vowed to give 100 vessels each of butter and akkaravadisal to Lord Azhagar if he makes her union with Lord Ranganatha possible, she did not return to do the same after her union with the Lord. So Sri Ramanujar decided to do the same on behalf of Sri Andal. He did the same and then on the way to Srirangam he visited Srivilliputhur. When he entered the temple there, it is said, Sri Andal came out of the sanctum to welcome him and called out, “nam koil annano! ?”(Is it my elder brother from Srirangam?). From that day Sri Ramanujar is regarded as the elder brother of Sri Andal. This is also highlighted in the Vazhi Thirunamam of Andal:. பெரும்பூதூர் மாமுனிக்குப் பின்னானாள் வாழியே etc. These 143 pasurams (verses) are organized in 14 segments and each one is called "Thirumozhi", sacred sayings. Thus the first set of ten pasurams is called as first Thirumozhi. And is named after the first phrase of the first pasuram ‘tai oru tingalum' (தையொரு திங்களும்). Similarly all the other Thirumozhis are named after the first phrase of first pasuram. That way the sixth Thirumozhi is called Varanam Ayiram (வாரணம் ஆயிரம்) in which Andal describes her dream which revealed scenes of her wedding ceremony with the Lord. This is a popular well-known Thirumozhi which is sung in marriages as well, as Andal has declared in this Thirumozhi itself that those who chant this Thirumozhi will beget children with Satva Gunam and Brahma Jnanam. 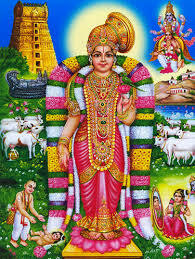 Sri Andal has another uniqueness in that she is now worshipped as God and has a separate shrine dedicated to her in most of the Vishnu temples in Tamilnadu by the side of the main deity. 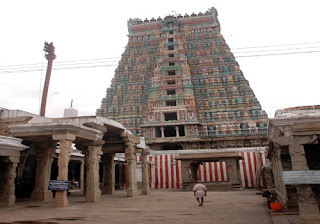 In Srivilliputhur where she grew up there is a separate temple dedicated to her next to the main Vadabadrasai temple, both in the same compound. Simply nice. Thanks aplenty. May Andals grace be on all.